I was talking to a friend of mine who has recently got married and shifted to the West with her new husband. Of course while in India she never bothered to cook. But now away from home, she terribly misses home cooked food and of course Indian take-aways do not do the job. She is one of those people who hates cooking. When I asked her what is her main peeve against cooking, she said it was the chopping. She did not mind the stirring, or patiently frying the masalas. But she hates chopping with a vengeance. A couple of times her freshly manicured nails have been chopped of and one time her sweet smelling nails smelled of garlic. Horror of horrors! That put her off chopping for ever. So I decided to share an easy recipe which with a little bit of judicious shopping involves almost no amount of chopping. Yes you heard me right. This recipe is for all those ladies out there who stay away from cooking because you are freaked out by the idea of damaging your precious manicured nails or nail art. 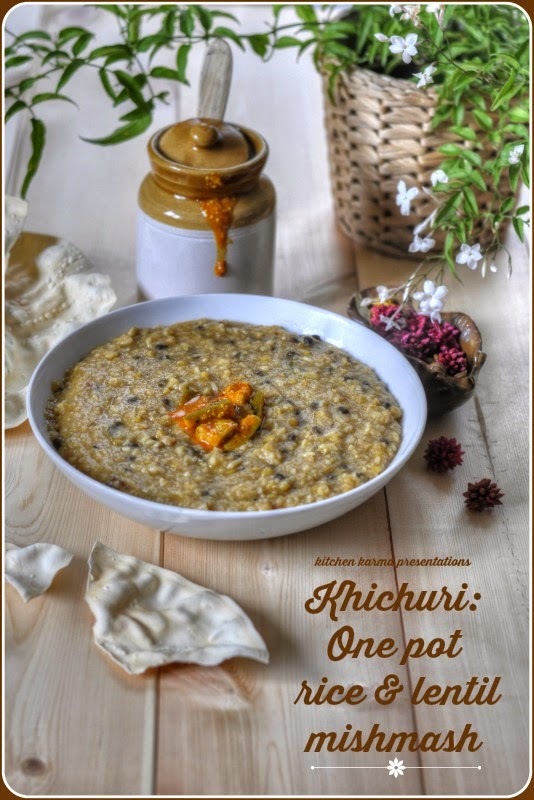 It is an easy peasy, shortcut khichdi recipe. In case you are wondering what khichuri/khichdi is, it is a rice and lentil preparation with a little spice thrown in. It is an one pot dish, popular all over India and each region has their own recipes and specialities. Not to be left behind we Bengalis also have our versions. One is made with moong daal and served as prasad to the Gods, while the masoor daal one is a particular favourite monsoon food. This khichdi is not the Bengali version. It is a mix and match of the Bengali, Maharastrian and UP versions. When I used to live in Delhi, my friends and roomies often used to cook khichdi. Sometimes I crave their versions, since I am not going to get that here, I settled for the next best thing-- developed a recipe of my own to satisfy my cravings. 2. One cup daal/lentil (you can use masoor or moong or a mixture of 3/4 varieties like I have used this time). But be sure and soak the daals at least for 2 to 4 hours or even overnight before cooking. Masoor daal cooks pretty quickly. So if you are using only masoor & kong daal no need to soak it extra long, but the other daals do need that extra soaking. 6. 2 tea spoons of ghee, if you do not have ghee you can alternately use butter or vegetable or any other clear oil. But you won't get the flavour of ghee in your khichuri. 1. 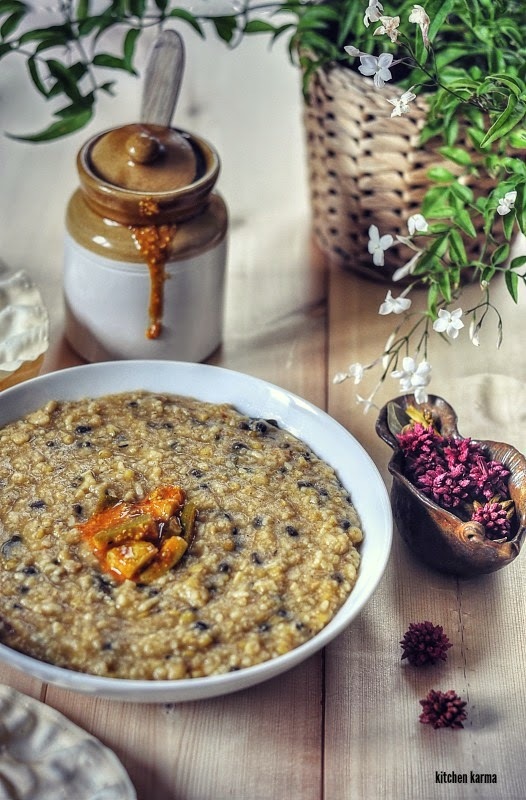 Soak one cup of rice and one cup of masoor daal or any other daal or even a mixture of different varieties /lentil for about 20 mins in cold water. Remember to wash the rice and daal at least a couple of times till the water runs clear, before soaking. If using mixed daal, please soak those daals which take longer to cook for longer periods of time. Like this time round I used some remaining black urad daal, I soaked this daal for about 2 hours. This is a good recipe to use up little leftover lentils. 2. Heat about 2 table spoons of vegetable/sunflower oil in a heavy bottomed pan. 3. Add a tea spoon of cumin seeds, 2/3 whole red chillies (seeded or deseeded according to taste, I prefer deseeded) and a pinch of asafoetida. Let the cumin seeds crackle and then add one tea spoon of turmeric powder and red chilli powder each. Keep the heat medium low and cook till the turmeric powder starts to smell cooked. Then add the rice and daal and about 2 cups of water and salt according to taste (I generally add about one tea spoon of salt and taste it once the khichdi is cooked and adjust according to need), mix everything well together and let it cook. Keep the heat medium low and stir occasionally, so that the mixture does not stick to the bottom of the pan. After 10 mins or so add half a cup of fried onion and half a tin of tomatoes. Mix well, you may need to add about a cup or so of water around this time. 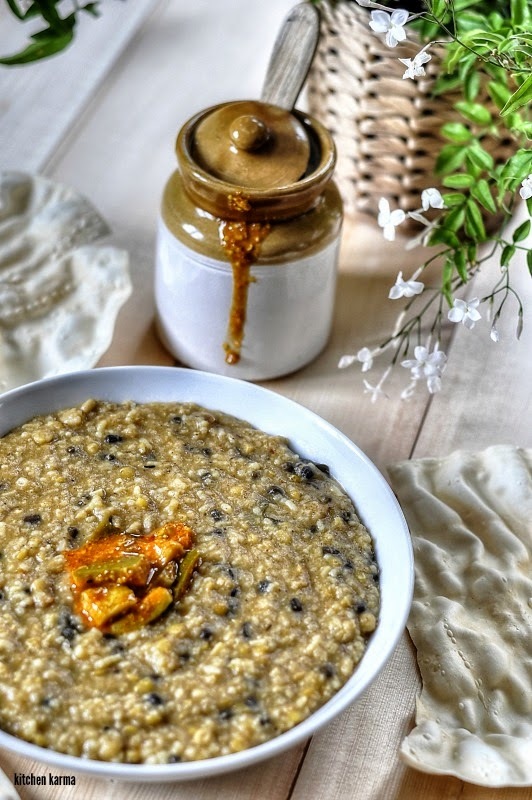 In a small frying pan heat about 2 table spoons of ghee (can use oil if you want, but will not get the taste/flavour you get from ghee), add one tea spoon of finely minced ginger and garlic each or if you do not want to go into the bother of chopping, just use ginger garlic paste. Also add a couple of green chillies (seeded or deseeded) and a pinch of asafoetida, cook till the ginger and garlic are well fried. You can also add 5/6 curry leaves for some extra flavour. Add this to the rice and daal mixture and mix well. Let the mixture boil for 5 mins more, before checking the taste and also whether both the rice and the daal are cooked. Once you are satisfied, switch off the heat and garnish with some chopped cilantro. Let the rice sit for about 10 mins before serving with poppadoms/papads, pickle, fritters, Indian omelette, fish fry (a typical Bengali way of serving) and some even serve this with yogurt. * I use up my left over lentils in this preparation. Glad I found your blog. Is that a dollop of pickle on top? Do you give the recipe for that? We always love it at our Indian grocery that also serve food. We can never get enough of the homemade pickles. Forgot to check the notify me box so I'm commenting again! Thanks!